Mountain biking developed in the late 1970’s with people in California and Colorado who wanted to take advantage of their mountainous regions and try something new. People began taking cruiser bikes and started to refit them with larger tires and stronger brakes to handle the mountain trails they rode on. Companies are now designing mountain bikes with a much higher level of sophistication to the point that they are built vastly different when compared to cruiser bikes. The bike frame is one example of change; the frame needs to be less rigid for riders to have more control when they need to take sharper turns and jump over large bumps in the trails. 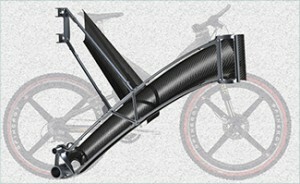 In short, mountain bike frames needed to be flexible and sturdy in construction. 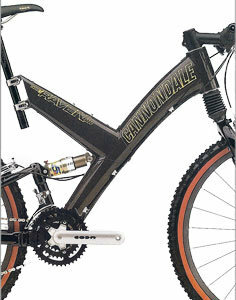 Cannondale sought the help of Adept with concept of designing a composite mountain bike frame that was not only lightweight and incredibly durable, but also flexible in order for the rider to effectively conquer ever changing terrain. Cannondale had no method of manufacturing and asked Adept to develop one along with a new design that would accomplish their criteria while abiding by strict quality control. Adept had never designed a bike frame before, but with it’s expertise in mechanical engineering and Advanced CAD techniques they were able to successfully design a bike frame up to the standards of Cannondale. Adept treated the exoskeleton of frame similar to truss designs and specifically borrowed aircraft technology to design the composite mountain bike frame exoskeleton, mimicking its geometry and lightweight construction. 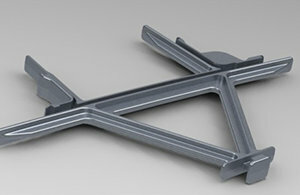 Using CAD and “shell theory”, Adept designed several interlocking parts of aluminum extrusion that would make up the exoskeleton. When all of the parts were interlocked, the exoskeleton was so light that an average adult could hold the entire frame with a couple of fingers. Moreover, they could shake the frame causing it the whole exoskeleton to sway, and still none of the pieces would fall out of place. The skeleton also served as an interlock for the frames composite shells. 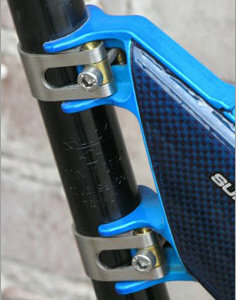 When the shells were bonded to the aluminum center section the frames strength and rigidity became evident, while retaining the necessary flex to make riding comfortable and to give a better performance. Complex CAD Modeling with advanced surfacing. Microsoft CAD Excellence Award winner. Strength and Flexibility hand calculations (no FEA). Aircraft technology applied to Bicycle geometry. Rapid Prototyping Quick Cast technology. Optimize for strength while controlling deflection. Utilize Composite materials and advance manufacture technology.